Jan. 26 (BusinessDesk) – The New Zealand government has published a 277-page assessment of the Trans-Pacific Partnership trade and investment agreement, concluding it is in the national interest, protects Maori rights under the Treaty of Waitangi, and carves out the ability for governments to regulate in key areas, including land and water rights, without fear of being sued by foreign investors. 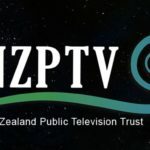 The release of the National Interest Analysis, a document required ahead of a parliamentary select committee inquiry into the TPP as part of the ratification process, comes as opponents accuse the government of seeking to incite violent protest by holding an international signing ceremony in Auckland two days ahead of the Feb. 6 national day, Waitangi Day. 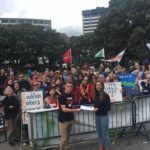 “Hosting the signing of the TPPA at SkyCity just before Waitangi Day is a calculated move by the government, presumably with the goal of inciting violence and attempting to discredit the huge campaign against the TPPA”, said Barry Coates, Green MP and spokesperson for the anti-TPP movement, It’s Our Future, in a statement. The NIA document’s release also coincides with the release of a final version of the TPP text and a decision by the Canadian International Trade Minister, Chrystia Freeland, to attend the Feb. 4 signing, scotching speculation that the newly elected Canadian government of Prime Minister Justin Trudeau might walk away early from the pact, which was negotiated in the dying days of the country’s previous administration. It was “too soon to close the door” on TPP, although “signing does not equal ratifying,” she said on the same day as New Zealand Labour Party leader Andrew Little told Radio New Zealand that a Labour-led government would “defy” and “not be bound by” any elements of the agreement that broke Labour’s bottom-line conditions. The area of greatest pressure for Labour is the treatment of land sales to foreigners. 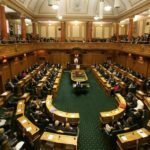 Labour wants to be able to curb residential land and house sales to foreigners and does not regard a clause in the TPP, inserted by New Zealand negotiators and allowing discriminatory tax treatment of residential land sales to foreigners, as sufficient protection. TPP also, for the first time in such an agreement, creates processes “which may include taking into account information related to traditional knowledge”. “This is an important step forward for the protection of traditional knowledge,” the NIA says. On the much-criticised investor-state dispute settlement provisions, allowing investors to take governments to arbitration, the NIA notes that “agreements relating to matters such as land, water or the delivery of correctional, healthcare or other social services are not covered by investment agreements and are not subject to ISDS” and that ISDS provisions only relate to the investment chapter and not other parts of the TPP text. TPP also requires that the tribunals hearing ISDS disputes be open to the public, that their decisions be published, and that expert and other witnesses be able to be called to give evidence.